The Wood Badge program originally focused exclusively on Scoutcraft skills and Scouting requirements. Beginning in the 1950s, Béla H. Bánáthy, Chairman of the Leadership Training Committee of the Monterey Bay Area Council, formulated the idea of an experimental leadership training program. He named it White Stag Leadership Development after the white stag of Hungarian mythology, the emblem of the Fourth World Scout Jamboree, which Bela had attended when he was 14 years old. With the active interest and support of the Monterey Bay Area Council executive staff and board, Bela continually improved his experimental program. In 1963 Maury Tripp and Fran Peterson were working closely with Bela. They also served on the National Council of the Boy Scouts of America and brought the White Stag program to their attention. In November, 1963, John Larson of the National Council's Research Service observed the program's annual Indaba at the Presidio of Monterey. Impressed with what he witnessed, he recommended that the national office conduct a detailed analysis of the White Stag program. During a thorough study, they interviewed participants, parents, and leaders. They distributed questionnaires to program participants, reviewed the White Stag literature, and observed the program in action. They also conducted a statistical analysis of troops taking part in White Stag and compared them to non-participating units. In December 1965, Chief Scout Executive Joseph Brunton received the ''White Stag Report''. It stated that offering leadership development to youth was a unique opportunity for Scouting to provide a practical benefit to youth and would add substantial support to Scouting's character development goals. It recommended that Wood Badge should be used to experiment with the leadership development principles of White Stag. Dr. John W. Larson, Director of Boy Scout Leader Training for the National Council, worked with Béla H. Bánáthy and Bob Perin, Assistant National Director, Volunteer Training Service, to write the new Wood Badge syllabus. Shifting from teaching primarily Scoutcraft skills to leadership competencies was a paradigm shift. It required rethinking the underlying assumptions, concepts, practices, and values guiding adults were trained as Scout leaders. Some individuals on the national staff resisted the idea of changing the focus of Wood Badge from training leaders in Scout craft to leadership skills. Among them was Bill Hillcourt, who had been the first United States Wood Badge Course Director in 1948. Although he had officially retired on August 1, 1965, his opinion was still sought after and respected. Larson later reported, "He fought us all the way... He had a vested interest in what had been and resisted every change. I just told him to settle down, everything was going to be all right." Hillcourt presented an alternative to Larson's plan to incorporate leadership into Wood Badge. Chief Scout Brunton asked Larson to look at Hilcourt's plan, and Larson reported back that it was the same stuff, just reordered and rewritten. Larson's plan for Wood Badge was approved and he moved ahead to begin testing the proposed changes. In February 1966, Brunton appointed seven men to a National task force to lead the effort: Robert L. Calvert, head of the BSA Education Division, was chair of the committee composed of A. Warren Holm, John Larson, William E. Lawrence, Ben H. Love, Kenneth Wells, and Joseph W. Wyckoff. Their plan identified Wood Badge and senior patrol leader training as the best opportunities for providing leadership education within the BSA. Their report recommended that the National Council develop an experimental Wood Badge program as soon as possible to be tested at Schiff Scout Reservation, to be followed by further testing in selected local councils. In January 1967, John Larson, along with assistant national director of Volunteer Training Bob Perin, were tasked with working with Béla H. Bánáthy to write a new Wood Badge staff guide focusing on leadership. Lawrence, who was director of the Volunteer Training Service, selected councils to pilot-test the new course. In May, individuals from six councils met at Schiff Scout Reservation to prepare to deliver the June course and follow-on council courses. The councils represented were Del-Mar-va Council in Wilmington, Delaware; Baltimore Area Council in Baltimore, Maryland; Valley Forge Council in Pennsylvania; Onondago Council in Syracuse, New York: and the National Capital Area Council in Washington, D.C.
During 1967, a selected group of young men were recruited from troops in the Monterey Bay Area to attend White Stag that August. The boys attending the course were among a select group pilot-testing a unique approach to teaching both the boy and adult leaders in sequence. After the boys completed junior leader training, their adult leaders attended Wood Badge at Fort Ord, California over four weekends during January and February 1968. 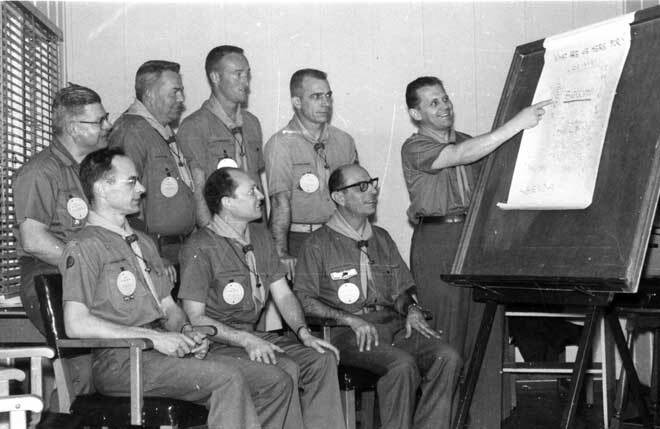 The National Council presented the first experimental Wood Badge program that taught modified versions of the White Stag leadership competencies beginning on June 17, 1967. Bob Perin was Scoutmaster, Louis Adin of the Circle Ten Council in Dallas was senior patrol leader, and John Larson was assistant senior patrol leader. Participants were primarily from the councils who would conduct the next step in laboratory-testing the new program. One month later, on July 18, the Circle Ten Council presented its first new Wood Badge program at Philmont, while Bob Perin and John Larson watched from the sidelines. In September 1967, the Monterey Bay Area Council, Piedmont Council, Middle Tennessee Council , Del-Mar-Va Council, and Hiawatha Seaway Council (formerly Onondago), along with the Circle Ten Council, were authorized to conduct experimental Wood Badge courses during 1968. The Course Directors were, in order, Béla H. Bánáthy, Don Crawford, Jimmy Stevens, Bill Whisler and Carson Buck. Adult staff development at Asilomar in Pacific Grove, California during 1962. In Monterey, Bánáthy was Director of Wood Badge course #25-2, Joe St. Clair was Scoutmaster and Fran Petersen was Senior Patrol Leader. John Larson, by now the Boy Scouts of America's National Director of Education, was also present. The Scout leaders of the troops whose boys had attended White Stag the previous August were invited to attend Wood Badge. The course was held over four weekends during January and February, 1968 at Fort Ord, California. In a unique application not since reproduced, all attendees were also asked to bring their troop to a single week of summer camp. Many of the Wood Badge staff also were present during that week of summer camp to follow up on the Wood Badge participant's tickets and their application of the leadership skills learned at Wood Badge. During the summer camp, a day-long leadership symposium was held for the youth and adults during summer camp. The results were promising and John Larson was appointed director of leadership development and charged with continuing to support the experiment. Gene Rutherford of the Circle Ten Council along with Crawford, Stevens, Whisler and Carl Marlowe of the Hiawatha Council were charged with evaluating the project. The pilot-testing and experimentation continued for three more years, and an experimental junior leader training program was begun in 1969. This later became Troop Leader Development before it was renamed Troop Leader Training Conference and then Junior Leader training Conference. In 1971, experimental courses were held at Schiff, Philmont, the five test councils, and in every national region excepting Region 8. The traditional Wood Badge course was still offered elsewhere. In 1972, after nearly five years of testing and experimentation, the Wood Badge program incorporating the leadership competencies of White Stag became the official program in the United States. An experimental Cub Scout Trainer Wood Badge was field tested in 1976. In 1978 it was adopted as the official advanced training program for adult Cub Scout Leaders. During 1978, the national council evaluated the Boy Scout Wood Badge program and felt a need to put more emphasis "on the practical aspects of good troop operation." The modified course blended Scoutcraft skills and troop management practices along with scaled-down content about the leadership competencies. In 1994, the National Council revised the course content again to add key concepts based on ''Ethics in Action'' which had been added to Boy Scout training and literature. In 1998, they published a new version titled ''Wood Badge for the 21st Century'' which was initially revised to include principles of Situational leadership theory, required the Boy Scouts to pay royalties for each Scouter attending Wood Badge nation-wide. The Wood Badge Task Force decided to describe how groups change and evolve using more generic, non-trademarked language free of royalties. The program emphasized the stages of team development based on the principles described by Bruce Tuckman in 1965 as forming-storming-norming-performing. The National Council required all councils to implement ''Wood Badge for the 21st Century'' as the official Wood Badge program on January 1, 2002. At one time based on eleven specific leadership competencies adapted from White Stag Leadership Development Program during the 1960s and 1970s, it was 35 years later, with a 21st Century imprint, based on generic group leadership concepts from the 1960s. With the release of ''Wood Badge for the Twenty-first Century'', the National Council also removed much of the Boy Scout-specific information from the program. This allowed the National Council to designate Wood Badge as the advanced leadership training program for all branches of Scouting, including Cub Scouts, Boy Scout, Varsity Scouting and Venturing Programs. Originally written by Brian Phelps, this article is licensed under the GNU Free Documentation License. It uses material from the Wikipedia article "Wood Badge (Boy Scouts of America)".